CRIBPOINT Rotoflex™ is a bin flexible, industrial dispensing and return capable system for a wide range of items. The CRIBPOINT Rotoflex has flexible bins located on three rotary storage stacks. Each stack has eight columns that can be subdivided into up to 60 individual compartments for flexible compartment utilization. The items are accessed through dual apposing tambour doors that open vertically to reveal only the selected item in the compartment. This door design allows compartments size from 2 inches to 60 inches high. Reconfiguration of storage compartments is quickly accomplished by removing a bin retainer and repositioning the shelf to the new desired location. This unparalleled flexibility earns the Rotoflex name. Depending upon item size and bin configuration, the CRIBPOINT Rotoflex stores and dispenses approximately 500 items. Flexible bin height configurations for the control of geometrically challenging items. Store items up to 60 inches in length. Items issued at the point-of-use, tracks consumption. Touch screen control for ease-of-use. Network-ready for flexible positioning in your facility. Configured to dispense a wide array of products. Easy to learn touch screen interface. Bar code reader enabled, optional HID and Magnetic Stripe Readers. Networked to CRIBWARE® software and other CRIBPOINT solutions. Flexible bins for dispensing desired usage quantity. Items do not drop; allowing for fragile or heavy items dispensing. Authorized usage and accountability tracking. Restriction of item usage in a set time period to reduce consumption. Items are stored and available where they are needed and used. Reduces shrinkage and increases security. Available anytime, controlled all the time. Simple operations reduce training needs. The CRIBPOINT Rotofex activity is monitored, controlled and reported by the CRIBWARE® system. CRIBPOINT Rotoflex utilizes the powerful CRIBWARE software, blending inventory control technologies with process activities to extend control to all aspects of your material storage and usage needs. 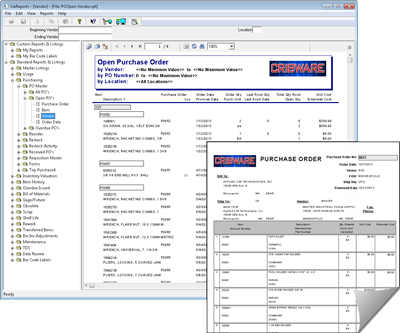 CRIBWARE sets itself apart from other stock management systems by offering complete planning, inventory control, purchasing, cost and usage monitoring, in a comfortable user interface. Reports and analysis tools to provide immediate and comprehensive information by machine or entire facility. Reporting is an integral part of the CRIBWARE system. It provides the tools to review, analyze, document and export CRIBWARE information. Reports are organized by categories and sub-categories for broad view or detail-rich information. With over 350 reports available for viewing, exporting and/or printing, CRIBWARE reports are robust and graphically pleasing and present the information quickly and easily. the first tabour door machine of its kind on the market. Multiple and mixed secure storage technologies management.